The entire roster of the 252 Classic took a group photo after Team Gold beat Team Black at Fike High Sunday evening. Greene Central star Imajae Dodd, pictured bottom left, had 17 points, was named MVP of the game and finished third in the dunk contest. Also pictured from The Wilson Times readership area is Fike's Elijahwon Cooper, Wilson Prep’s Righteous Tomlin and Tyronne Whitaker, Greenfield's Bryson Baker, Southern Nash’s Darius Edmundson, and Greene Central’s Donte Johnson. Greene Central basketball star and UNCW signee Imajae Dodd added another honor to his illustrious career by winning MVP at the Team Power Foundation’s inaugural 252 Classic High School Senior All-Star Game on Sunday evening at Fike High. Dodd put up 17 points while leading Team Gold to a 100-95 win over Team Black. 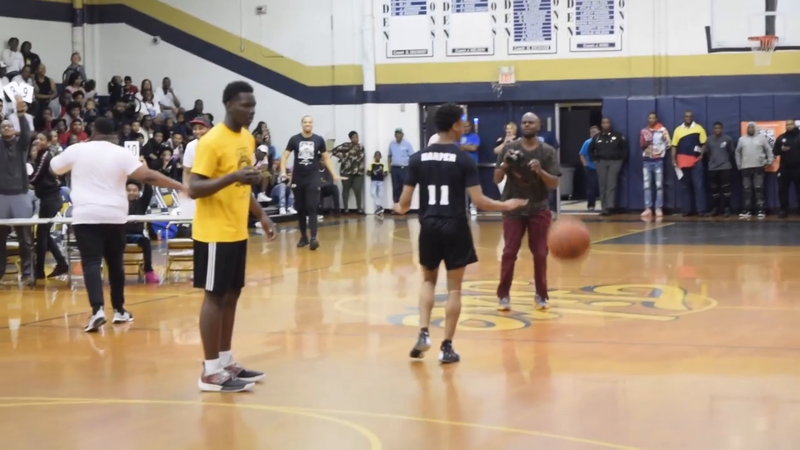 The event is the second benefit by the Wilson-based Team Power Foundation and had eight seniors from The Wilson Times readership area, including Fike guard Elijahwon Cooper and Wilson Prep’s Righteous Tomlin on Team Gold. Bryson Baker of North Carolina Independent Schools Athletic Association 1-A champion Greenfield was on Team Black along with Tyronne Whitaker of Wilson Prep, 3-A Big East Conference Player of the Year Southern Nash’s Darius Edmundson and Greene Central’s Donte Johnson. In the dunk contest before the game, Wilson Prep’s Sean Sanders, Tomlin and Hunt’s Malcolm Coley were eliminated after the first round. Dodd advanced to the final round where he was eliminated by Farmville Central’s guard Rande Harper and John A. Holmes guard C.K. Everett, who needed a dunk-off to decide the contest which Everett won.